What would Christmas be without the traditional cookies and a German favorite, stollen? 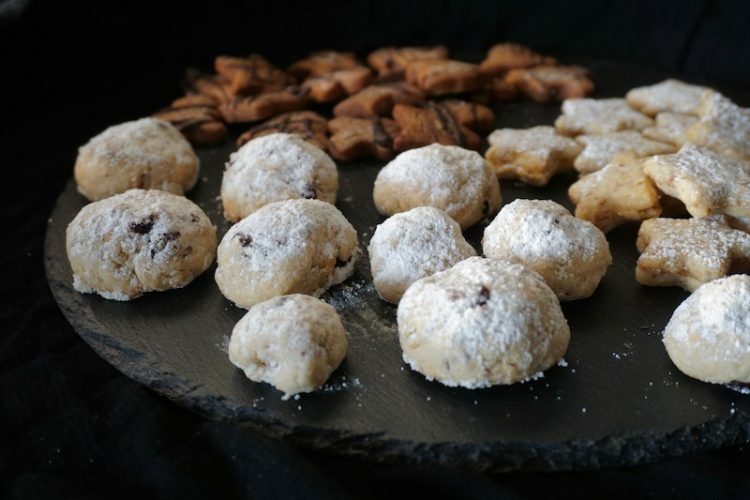 Especially to be precise the amazing combination of both: stollen bites! Because these mini stollen are the perfect mixture of the great taste of stollen combined with the practical snack size of Christmas cookies. The little balls are perfect for a snack on the go and taste and look like their big counterpart. In my variation they are even vegan and made really quickly. Just prepare the dough, roll a long tube and form little spheres. And I think they taste even better than the storebought kind. Because I replace all the raisins and candied orange and lemon peel completely with cranberries, which taste better. But you of course can also stick with the classic variation. My other two favorite Christmas cookies, which are chocolate-gingerbreads and orange-almond-stars, will also be featured on the blog soon. Stir together 500 g flour, 2 tbsp sugar, 2 tsp spices for stollen, the finely grated skin of a lemon and a pinch of salt in a bowl. Form a well in the center and add 120 ml of lukewarm milk. Add the yeast to the milk. Cover well and let sit for 10 minutes. Meanwhile whip together 200 g soft butter, 100 g powdered sugar and 70 g marzipan (heated for a short time in the microwave it becomes easier to work with) in another bowl until very creamy. Chop 200 g dried cranberries into smaller pieces. Add together with 100 g chopped almonds, 40 ml rum and 2 drops of almond extract (see note above) in another bowl and stir together. Mix the milk together with the flour. As soon as the dough is sort of lumpy add the butter-marzipan-mixture plus the cranberry-almonds and knead well. The dough should be of even consistency and barely stick to a rubber spatula. If necessary add a bit more flour. Cover and let stand for 50 minutes in a warm place (the dough will not rise very much). Preheat the oven to 390° F (200° C, upper- and lower heat). Cover baking trays with foil. Separate the dough into 4 portions. On a floured surface roll one portion into a long tube. Cut the tube into small pieces and roll into little balls. The stollen bites will rise while baking. I like mine to be about the size of pralines. Place the stollenbites onto a baking tray and bake for 15 minutes at 390° F (200° C, upper- and lower heat). Melt the remaining 50 g of butter. Brush the still hot stollen bites with butter and immediately dust with powdered sugar. Will keep in a good closing, cool kept tin till after Christmas. I do like them fresh the best though.